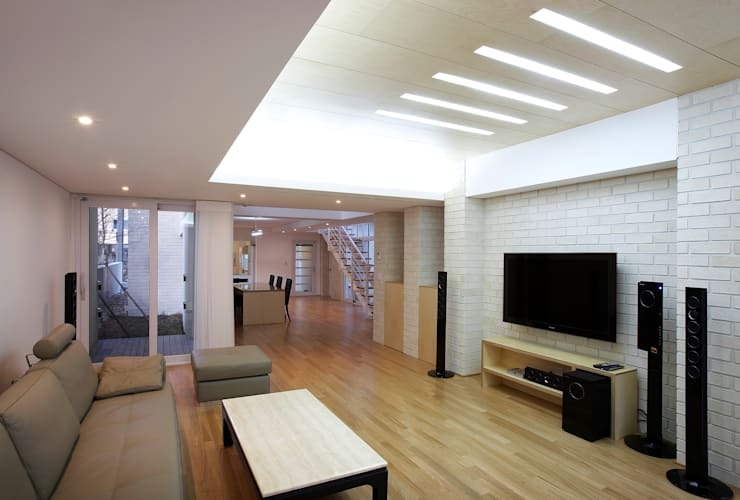 Korea is a country of compact living, and with more than half the population residing in apartments, owning a freestanding or detached dwelling is a privilege and a luxury not afforded to many. Due to the high price of land, it can be difficult designing and building an expansive dwelling, but the owners of today's property have done so, and in exceptional form. As time has shifted so have peoples view of city living, and consequently, many families and individuals are choosing to live rurally rather than centrally. The dwelling we are featuring today is an exemplary abode, which is both opulent and stylish. Displaying a modernist façade and contemporary elements throughout, this behemoth white residence is a monumental tour de force upon its landscape. 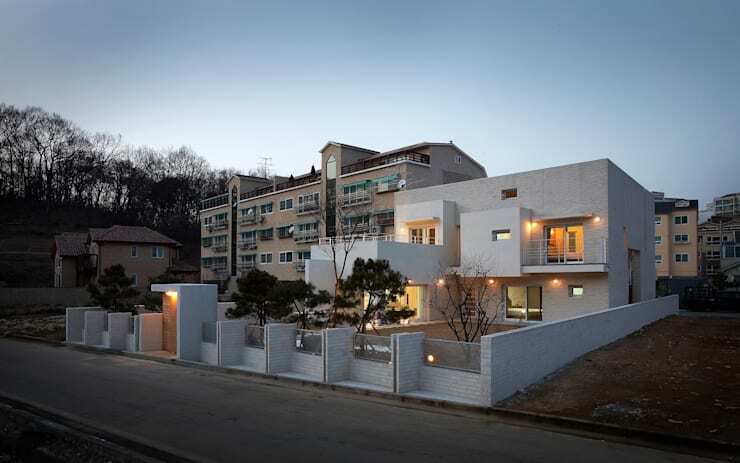 Planned, designed and managed by the Korean architectural firm Atelier 17, this striking home is both large and lavish, contributing to its appeal and statement making presence. With a generous 574 square metre plot size and 260 square metres of living space, this impressive home is a wonderfully inventive and interesting dwelling. If you would like to take a look inside, check out the images below and get a little inspiration for your contemporary home. Built upon a rather large plot, this large dwelling is imposing and grand. The basic structure of the dwelling is reinforced concrete with insulation to all the walls and windows. As the weather can reach low temperatures and snow is frequent during the wintertime it was important to ensure the residence was well-sealed and insulated. The exterior space as we see here is replete with enough room for two vehicles, adding to the overall functionality and versatility of the home. Hard-wearing titanium zinc roofing was also added as an additional feature, ensuring good corrosion resistance. This rear area of the home has been designed with maximum windows to create a space for the house's occupant to watch the changing seasons and enjoy the large outdoor garden space. Moving closer to the rear of the home we are given a glimpse at the exterior and the plentiful entertaining options. The colour scheme of the façade is also quite clear with white the predominant hue, but surprisingly this works extremely well due to the structure's shape. The different cube-like sections create shadows and reflect light at different angles, in turn helping the home appear more interesting and intriguing. Here in this image we are also able to see the huge amount of entertaining space available. The room to the left of the picture shows an enclosed courtyard, with an exterior table that would be perfect for summer barbecues and get-togethers. 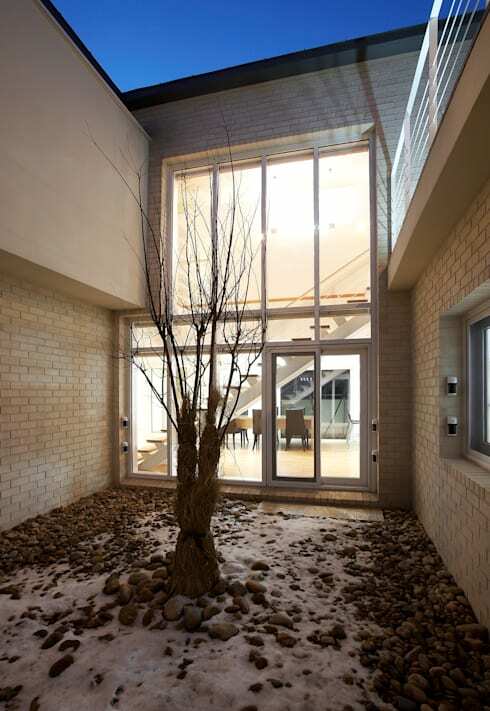 The clean minimalist charm of this home is palpable, and we cannot wait to check out the interior. 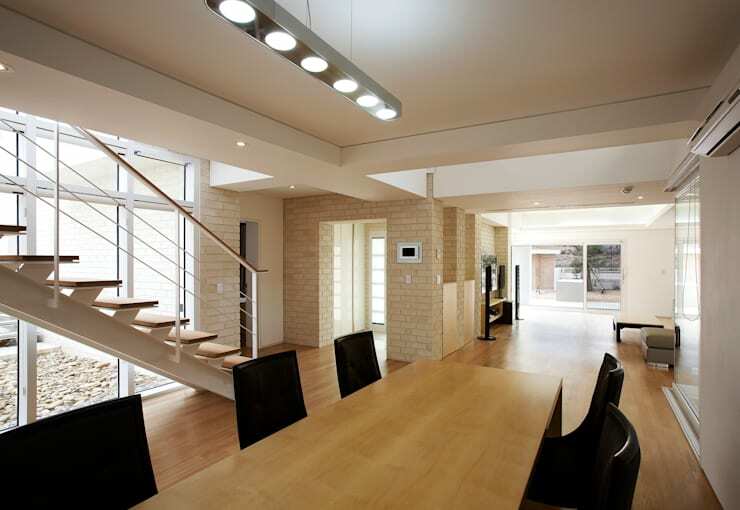 Moving inside the home we are able to witness the large and spacious interior living zones. These are particularly neutral in their colour scheme, adding a sense of openness and roominess. Here the dining room is one of the most important spaces within the dwelling. It stretches through to the living room and then onto the courtyard beyond. The home is fairly linear, which makes it easily navigable, and perfect for family living. The furniture seamlessly matched the interior architecture as well. Dining chairs are a stark black hue and dot the room adding interest and style to the space. The dining table itself is in-keeping with the timber flooring and warm earthy hue seen throughout the abode. From the dining room through to the living room the transition is seamless. However, once inside the living zone, it is cosy, welcoming and feels like its own area. Here the minimalist theme is continued with simple yet effective furniture. The wall-mounted television provides entertainment, while the sofa is large enough for the whole family. 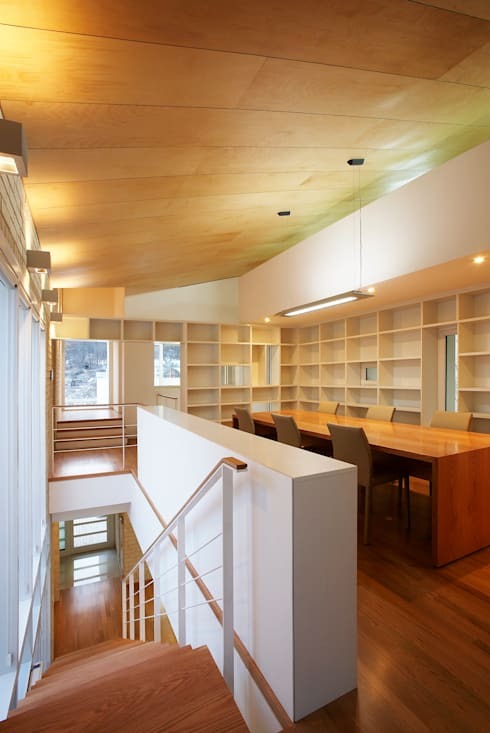 One of the nicest features within this dwelling is the recessed lighting. The lighting is set within the vaulted ceiling space to create a softer yet well-illuminated mood. Chic, sleek and wonderfully spacious, this area is a fabulous place to relax and unwind. Quickly taking a trip upstairs shows us a collaborative work room or alternative dining area. This space is fitted with wall to wall shelving, which works excellently in providing room for books, artwork and other cherished objet d'art. The ceilings are equally high upstairs as they are downstairs, adding opulence and comfort to the overall ambience. Here the architects have opted for an alternative to the typical white ceiling and instead employed timber cladding. The timber is soft and cosy, imparting homeliness and charm. As if this house couldn't possibly have any more stylish surprises it shows us its surprise courtyard garden! This neat space gorgeously hosts a large tree, and has plenty of room for quiet contemplation. The exposed brickwork is a nice feature and breaks up the rendered white walls seen on the majority of the dwelling's façade. Double height glazing shows the extensive indoor spaces within, and helps create a cosy and welcoming home. What do you think of this Modernist home? Do you live in a detached dwelling or a city apartment? Let us know by leaving a comment below!